Get up-to-speed on the latest security advances for cloud, big data and relational databases. In the wake of increasingly frequent data breaches and emerging data protection laws like GDPR, enterprise security has become paramount. Spending on enterprise security is forecasted to increase to $96.3 billion in 2018. As organizations continue to invest in business intelligence, big data, IoT and cloud, IT teams are introducing increasingly complex security mechanisms to authorize and encrypt access to data. Your analytics and data management tools need to be able to securely access data spread across different systems. They must run within existing policies, and without introducing security risks. 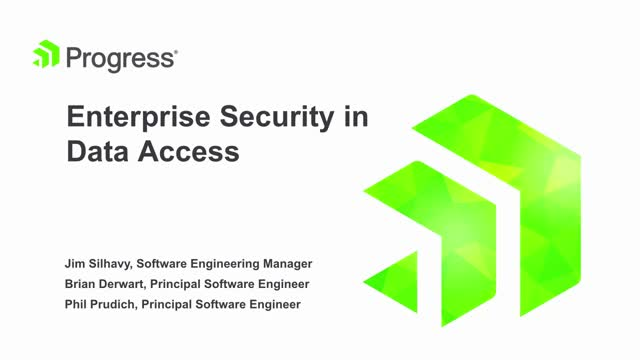 Listen to the Progress experts as they explain what it takes to securely access data from rapidly evolving enterprise data access layers. Enterprises always want their applications to be better, cheaper and faster, but they’ve often been forced to settle with two of the three. Until now, that is. What’s coming in Kinvey is a new tool built for visually creating engaging chatbots and immersive experiences across web, iOS and Android. Kinvey remains focused on developers and this approach delivers visual productivity while providing full control over the application code and development experience. You can build and maintain no-compromise enterprise-grade applications while avoiding many of the headaches traditionally associated with app development. APIs enable businesses to access popular data sources from their enterprise apps, but creating these connections is both difficult and time consuming. With Autonomous REST Connector, you can consume APIs in minutes using codeless configuration and intelligent sampling. Learn more in this demonstration. Headless content management—backend-only content management systems built to act as a content repository—enables enterprises to deliver rich, innovative content experiences across any channel. Developers are granted the freedom to use website development frameworks of choice and empowered to deliver content anywhere by generating OData APIs with click of a button—all while reducing costs, speeding time to market, and making seamless design changes without impacting backend systems. Cloud and big data are now mainstream—making IT’s challenge one of effectively integrating enterprise data with these modern systems. But the challenge is multifaceted, with IT needing to master modern ETL toolkits plus address new issues such as enterprise data security beyond the firewall, support for popular data sources such as Salesforce, Eloqua, SQL Server or Oracle, custom connectivity needs and more. To address challenges of increasingly competitive global economy, enterprises – both large and small - are embracing the digital shift. Completing this race for digital transformation, successfully, requires organizations to be nimble, and flexible enough to scale their applications in response to dynamic customer needs. Simply stated, businesses need to innovate and differentiate using new app experiences to stay competitive. However, modern application development requires new skills and capabilities that are not readily available in established organizations. These skills contribute to modern applications that delivers superlative user experiences and performance. Putting together teams with the needed skills in today’s tight labor market is a herculean task which gets even more difficult due to complexities like inter-connecting new applications with existing enterprise applications and legacy sources of data. In this Webinar, MicroExcel - a leading technology services and solutions partner for global customers, will share best practices to efficiently design and deliver innovative and timely solutions for their clients. You’ll learn how the right technology stack helps to bring down the cost of innovation, open up new opportunities for growth and develop competitive advantage. The hybrid approach includes adopting open source technologies, agile methodologies, cross platform frameworks and open cloud architectures. You’ll see how the right technology mix will help you deliver modern web, mobile, and chat applications to transform business. The promise of low-code for over-burdened app dev teams with a backlog of business demands is extremely enticing. The right low-code platform can help you get multi-channel business apps to market much more quickly than developing from scratch. However, low-code platforms fall flat because they are built on sub-optimal architectures that don’t support modern workloads and require a proprietary development approach that necessitates significant retraining. Additionally, many low-code vendors prioritize visual developer bling that promises to make your business counterpart a citizen developer over important enterprise architecture considerations valued by developers and enterprise architects. We also provide practical recommendations relating to serverless microservices and functions, full-stack development, NoOps, modernization, container support, hybrid cloud deployment and more. The mobile app revolution has hit the enterprise. Smartphones, tablets, watches—your internal users and customers demand engaging experiences on the devices they use, on their terms. Existing resourcing problems, enterprise/legacy systems and changing requirements impact your cost and speed of app delivery. Fortunately, newer techniques drastically reduce app costs and time to market. This webinar examines how enterprises are accelerating development, cutting expenses, and reducing their IT app backlog. See how to reduce your app backlog while retaining full control over application logic, compliance, security, user experience, and access control. There’s a new approach to app development. We call it serverless, but it’s also known as backend as a service (BaaS), function as a service (FaaS), cloud-native architectures, or microservices—just to name a few. Whatever you call it, this approach is giving developers new freedom to focus on frontend functionality and deliver better, more innovative user experiences. Confused? Join the Kinvey engineering team in this webinar as we go beyond the hype to simplify the serverless approach. Learn how organizations are adopting enterprise-grade serverless architectures to deliver apps faster across web, mobile and chat while maintaining secure integration with existing data and authentication systems. Forget worrying about backend functions and let your developers focus on what they do best—developing apps with a laser focus on the user experience. Hello Tractor wanted to create a mobile app that would help increase food production in sub-Saharan Africa, but didn't have the resources to build it quickly. Kinvey provided Hello Tractor with everything the company needed to not only build the app as envisioned but also accelerate delivery. With Kinvey, Hello Tractor could build the app in just 2.5 months. By providing farmers with greater access to tractors, this app is helping farmers throughout the region combat food insecurity. Progress Sitefinity is all about delivering best-in-class multi-channel digital experiences. The latest release builds on that legacy by enabling new levels of marketer and developer productivity. With this release, Sitefinity CMS not only changes the game for user experience but delivers tools that make managing and optimizing multi-channel customer experiences easy for marketers and developers at organizations of any size. Despite the importance of social media for customer engagement, many organizations simply don’t have the time or money required to grow their social footprint. Like that, tweet this—there is just so much to do, and it’s further amplified by the number of trendy new social sites popping up every month. In this webinar, you’ll discover how—with a bit of creativity—a web CMS like Progress Sitefinity can be used to craft great social experiences for your visitors and drive customer engagement. Be sure to join Seth Cleaver, Sitefinity Technical Engineer at Progress, to better understand how the right Web CMS can broaden your social reach. Demand for digital experiences such as mobility are putting pressure on enterprise teams and systems. Many of these systems are deployed on servers and not engineered to scale. Mobility projects across web/mobile, voice, chat and AR are increasingly running on serverless cloud native architectures. But how can organizations meet the customer demands for digital experiences on enterprise systems such as ERP systems or enterprise APIs? Join Progress Kinvey to explore four options to digitize enterprise systems to deliver experiences for the connected world. Held during the Mobile + IoT Summit: Integration Developer News. The better the technology, the more efficient the workflow. When time is money, mobile applications can be the single best solution for an enterprise looking to save both. Understanding which lines of business can most benefit from app abilities is the first step on the path to mobile success. Listen to Brad Shafton, Director of Innovation and User Experience at Hologic, and Sumit Sarkar, Chief Data Evangelist with Progress Kinvey, discuss defining ROI for mobile applications, process efficiencies, and showing value in project investments. Your application architecture will make or break digital transformation efforts critical to innovation. As technology executives, we know we can’t simply start over, we have to leverage existing systems while transitioning to a cloud-native architecture. Build the Apps Your Business Needs Tomorrow, Today. Data is exploding. Digital devices are proliferating. Interfaces are taking new forms. Everything must be connected. Developers need to deliver more sophisticated apps, faster than ever before. View our webcasts on mobile application development, website personalization, IIoT, data connectivity and integrations and more.